A good book on the topic is "Thinking in Systems" by Donella Meadows . It's a catalog of common system patterns and how they behave to give you some tools to answer the "then what?". A great book for this is Thinking in Systems by Donella Meadows. She has many illustrative examples that really help get the points across. Coming from an electrical engineering background, I found her discussion around the interactions between positive and negative loops to be very interesting. - Kumu (https://kumu.io) - Web-based tool for building interactive system maps. - Loopy (http://ncase.me/loopy/) - An playground for building interactive systems maps. 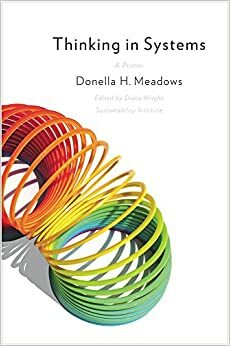 I remember the first time reading this book, or rather the 30 year update -- https://www.amazon.com/Limits-Growth-Donella-H-Meadows/dp/19... -- thinking, "this is the approach to take to understand how the economy, ecology, pollution, and so on interact." Everything else was just looking at elements. Technology is important, for example, but exists within a system. They looked at the system. They had to simplify and assume a lot, which the media didn't understand (probably benign ignorance) and critics blew out of proportion (probably maliciously), but I found their approach the most meaningful. Sadly, I know many people who care about the environment but don't understand the (relatively simple) math in their approach, and many people who understand the math but don't care about the environment, but almost no one who cares and understands. So in about a decade since reading it, I haven't found anyone I can talk to about it meaningfully. Both changed my views more than almost any other books. Basically, a while back, some people realized that all systems (which comprises just about everything, basically) share similar modelable attributes.